Home > Uncategorised > Celebrating the nation’s Bed & Breakfasts! 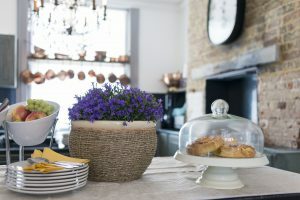 This week we are celebrating all things Bed and all things Breakfast, as today marks the start of National B&B Week running from Monday 18 – Sunday 24 March. The week was founded in 2018 by online booking technology company eviivo and the B&B Association and celebrates the incredible work of independent hosts across the country. As part of the celebrations, property owners have been asked to come up with special offers for guests if they book a stay during B&B week. Whether you’re a foodie, a fan of the great outdoors or fancy exploring some of the local culture, there’s something for everyone. Just some of the fantastic offers include sumptuous afternoon teas, upgrades and discounts, complimentary baking classes and a half Lake Cruise on Lake Windermere. One guest house is even offering £10 off for any guests who dress up in fancy dress! This year, we are delighted to have been chosen as National B&B Week’s official charity partner. eviivo asked their clients whether they could support the charity and we have been delighted with the generous spirit B&B owners have shown. We have received some wonderful offers of two-night stays for the families we support. Breaks are already confirmed at Brighton Marina House Hotel, Buscot Manor, Fourwinds Leisure, The Great Grubb, Riviera Guesthouse and Shores Hotel Blackpool. Properties such as Hillcroft Barn are helping to spread the word about our work and have added an optional £1 donation when customers confirm their stay. A huge thank you to all those who have offered their support! If you would like to get involved with the charity, please get in touch with Alex Bunney. Look out for all of the activity happening on social media this week and if you fancy checking out the wonderful deals, take a peek here!